Last year, on April 1, the blue corydalis "Porcelain Blue" from Hillier Nurseries was introduced by PlantHaven in North America. Many thought it was an April Fool's joke and thought that the flowers were dyed aqua blue. 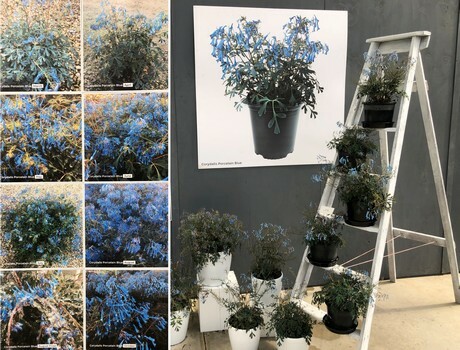 "Now we see that people are getting to know the variety and it's natural blue color", says Robert Bett, CEO of PlantHaven. He is satisfied with the global demand for this variety and surprised by the potential it has for Christmas in Australia. 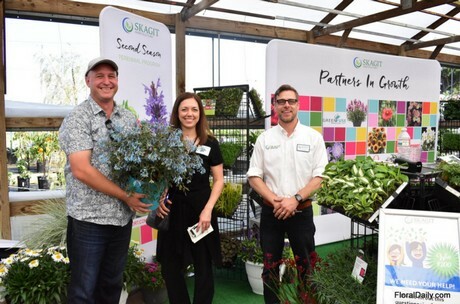 Robert Bett of PlantHaven holding the Corydalis Hillier 'Porcelain Blue', with broker Pam Youngsman of Poppystars and Marc Radsma of Skagit during the California Spring Trials 2019. 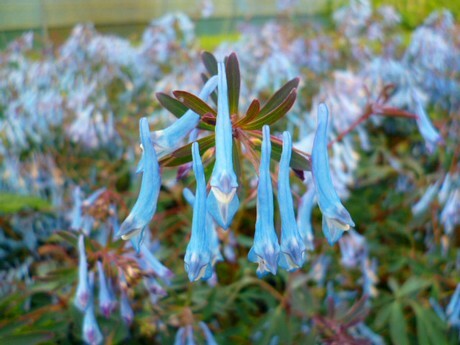 Corydalis "Porcelain Blue is part of the Hillier Collection by Hillier Nurseries from the UK. The aqua blue is what makes the flower stand out. The flowers are held in racemes in spring above the foliage and profusely repeat flowering in late summer-fall. However, there is more that makes this variety unique, explains Bett. "The foliage is blue-green fern-like foliage, it has no summer dormancy, is profusely repeat flowering and has no seed set." Close-up of the flower of "Porcelain Blue"
The funny thing about this variety is that it is a real global plant, as it traveled the world. "Porcelain Blue is a unique seedling selection from the Chinese species made by Hillier Nurseries UK and now propagated exclusively by tissue culture in China by Siere Handel and is afterwards sent to Skagit Horticulture, Heritage and Pacific Plug and Liners, who supply the liners. For Europe, the tissue culture source is Siere Handel in the Netherlands." Also in Australia, Australia Touch of Class Plants have been trialing the variety and it has the potential to be grown for Christmas. But blue for Christmas? Yes, according to Bett, the Elvis Presley song "Blue Christmas" is a good fit for the variety. On the left, the trials that show that the corydalis "Porcelain Blue" is flowering year round. But the plant seems to have more potential in Australia. "In a trial done in Melbourne, it was shown that the variety was flowering all year long, even when it was covered with ice. 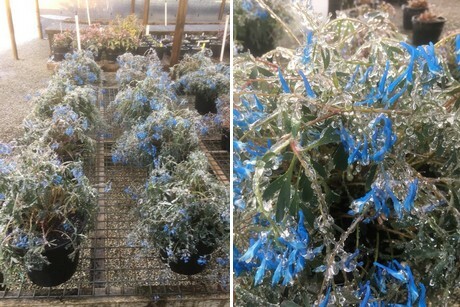 "Porcelain Blue" flowering during frost. PlantHaven International, Inc was founded by Geoff and Maureen Needham in January 1997 in response to a growing demand from plant breeders for good advice and representation in the North American market. "We are an independent agency assisting plant breeders worldwide in bringing their new plant varieties to market. So, PlantHaven does not breed or grow plants, or have any financial interest in any breeding program or nursery. Our revenue arises directly as commission on royalties. Our clients include independent breeders, breeding companies, and universities. Our goal is to maximize the market."